Abraham Lincoln measured the promise—and cost—of American freedom in lucid and extraordinarily moving prose, famous for its native wit, simple dignity of expressions, and peculiarly American flavor. This volume, with its companion, Abraham Lincoln: Speeches and Writing 1859–1865, comprises the most comprehensive selection ever published. over 240 speeches, letters, and drafts take Lincoln from rural law practice to national prominence, and chart his emergence as an eloquent antislavery advocate and defender of the constitution. 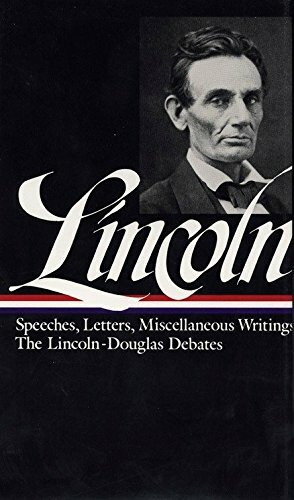 included are the complete Lincoln-Douglas debates, perhaps the most famous confrontation in American political history. LIBRARY OF AMERICA is an independent nonprofit cultural organization founded in 1979 to preserve our nation’s literary heritage by publishing, and keeping permanently in print, America’s best and most significant writing. The Library of America series includes more than 300 volumes to date, authoritative editions that average 1,000 pages in length, feature cloth covers, sewn bindings, and ribbon markers, and are printed on premium acid-free paper that will last for centuries.